The very first Gift Set 2 was actually the only place where you could have got a green Land Rover #406 in the early days. Here is a very nice example of that set, featuring the green #406 and red pony trailer #102. The Land Rover is very good, with just a bit of paint loss here and there. It has the tan tin canopy which is mostly undamaged and has the right folds but there is a scratch on top. 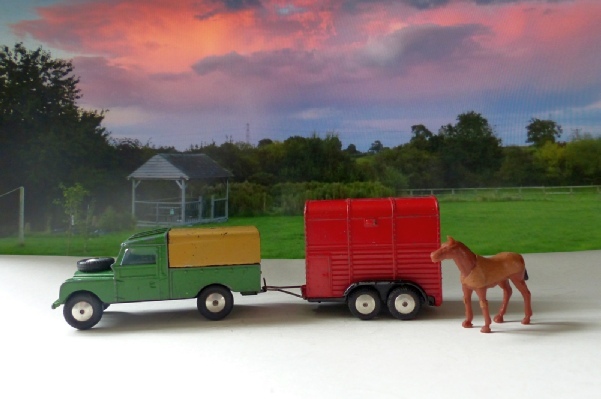 The red pony trailer is in good original condition, from my own collection. It has a few chips on the roof only and looks very nice. The ramp folds up and clicks in place and there is a pony but I think it may be a replacement.